On the occasion of the Foundation day of NG Town, Patna and CCL 2 Jersey Launch, 25 people have been awarded with Young Achievers of Bihar Award. By the courtesy of NG Town and Anumaya Human Resource Foundation, 25 people associated with different fields in society received Young Achievers Award for their splendid and remarkable contribution in their respective fields. In the Ganga resort of Capital city Patna, the Young Achievers Award -2018 honour ceremony was organized to encourage and boost the enthusiasm of the youth who made our Bihar pride. 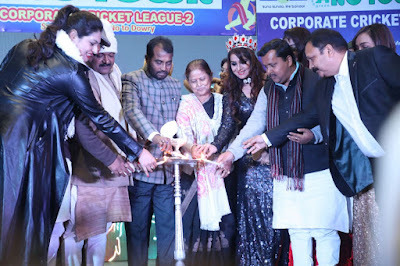 The event was organized on the occasion of Jersey Launch of Corporate Cricket League (CCL) Season-2 sponsored by NG Town CMD (Sanjay Singh and Namita Singh). On this occasion, 25 women and men were recognized who made their state and country proud with their inspirational work in their respective fields. The program started with the foundation day celebration of NG Town. Mayor Sita Sahu, MLA Nitin Navin, Shyam Rajak, Sanjeev Chaurasia, Ranveer Nandan, famous cancer specialist Dr. Jitendra Singh, Dr. Manoj Kumar from BJP doctor cell, Mrs. Asia Universe Dr. Manisha Ranjan, Manisha Dayal, Monika Mani, Aarti Singh and Chirantan Kumar jointly inaugurated the grand ceremony by lighting up the lamp. On this occasion, Shri Sanjay Singh and Smt. Namita Singh said that the history of Bihar has been very glorious. Many people in various parts and areas of the state are continuously trying to make Bihar a better and prosperous state with the feeling of selflessness. These 25 people have been given the Young Achievers Award as encouragrment and honor for the work done by them for Bihar and upliftment of the society as a whole. They gave gratitude to the people and gave New Year greetings to all. Program organizer and director of AHRF Manisha Dayal said that those real heroes have been honored in the event who are constantly working towards the betterment of Bihar and are determined for their aim of making it a properous state . She said that the main objective of this event is to give positive message to the whole society and to give appreciation and acceleration to the dreams of youth. This kind of programs increase the morale of the youth and they do their work and duties with more passion and enthusiasm. Program organizer Chirantan Kumar said that the 'CCL-2' Jersey was also launched with the slogan giving the social message of Say NO to DRUGS and Say NO to DOWRY and NG Town Foundation Day was also celebrated who are helping our program. He informed that on behalf of the institution, 25 people were awarded the Young Achievers Award, who made their strong identity by contributing significantly in the society. This includes people from to all areas. The awardees include Prem Kumar from Multilanguage news agency United News of India, Dd Anchor-Singer Jigyasa Jaguar , Tv/Air Anchor Priya Gautam, Manish Kumar from Food Bank, Dr. Akshankar Abhishek, Big FM MJ Shweta Surabhi, Madhulika Jha, Simran Singh, Rashmi , Social worker Shefali Bhardwaj, Pawan Preet , Soni Sahay, Ritu Choubey, Devopriya Dutta, Sweety Kumari, Manisha Shrivastava, Vishal Mohan, Chumki Das, Archana Kumari ,Prabhakar alok ,Sukirity Roy and Yanshi Malaya. Achievers Award was given by Mrs Asia Universe Manisha Ranjan, Sanjay Singh from NG Town, Namita Singh, Mrs. India Second Runner Up Monika Mani, Mrs. India Glamorous Aarti Singh, Dainik Jagran Sangini Club President Mauni Tripathi, Dr. Sachi Gunjan, Lion Veena Gupta, Dr. Vinita Trivedi. In the program, Dancers of the Apex Natraj and Khanak Dance Group forced people to dance with their booming presentation. At the same time in the live stage performances by the Jigyasa Jaguar, Vishu Baba Soni, Vinay Roy, Akash Ajnabee, Shubhra Rani and Mukesh Kumar made people crazy with the magic of their voice. The program was successfully anchored by Amar Raj Saxena, Sana Afreen, Robin Kiloshkar, Nikhil Raj and Sunidhi Wanya.